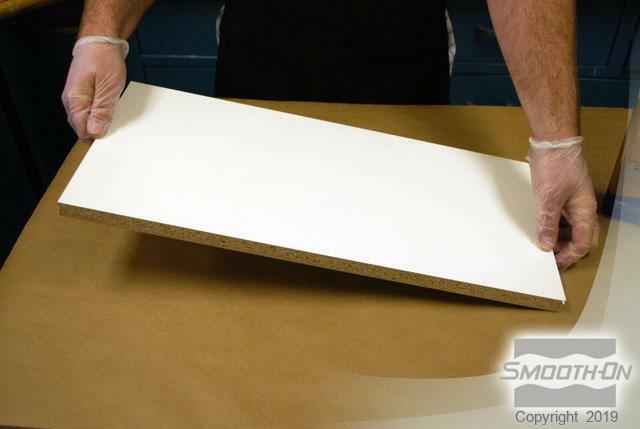 Urethane rubber is an excellent choice for casting props or costume pieces which require high abrasion resistance and durability. 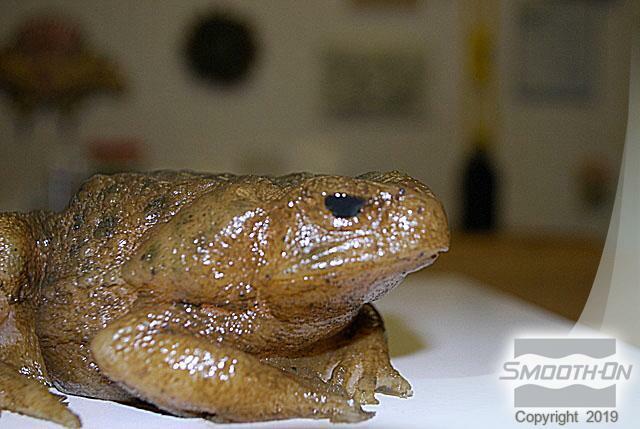 The challenge is finding a paint which will adhere to the surface of the urethane casting. 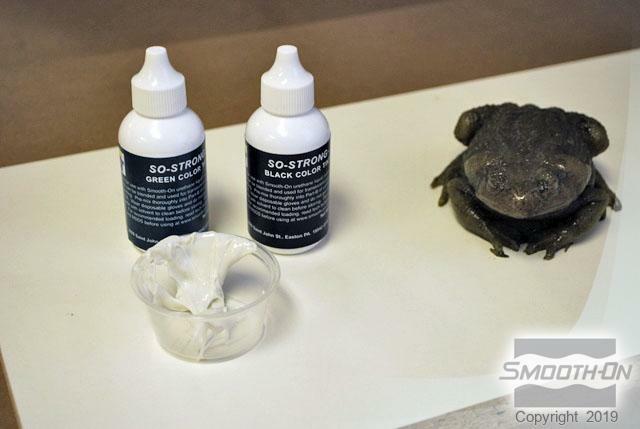 Some of our customers have found that our Brush-On 40 urethane rubber has excellent adhesion properties and can be used as a paint for urethane rubbers when combined with So-Strong pigments and thinned with mineral spirits. 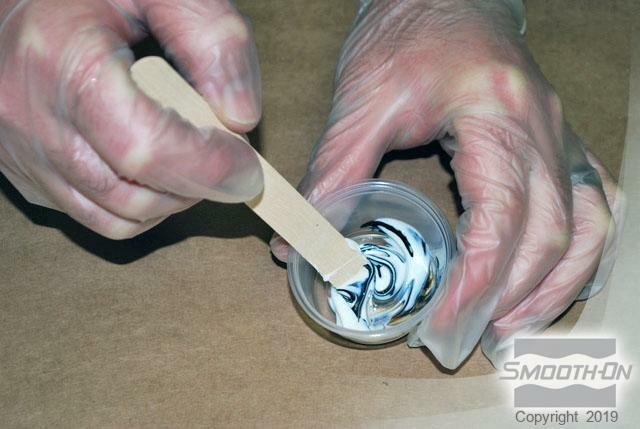 The pigments must be added to the rubber before the solvent is added, and for this reason, small batches of rubber should be mixed. 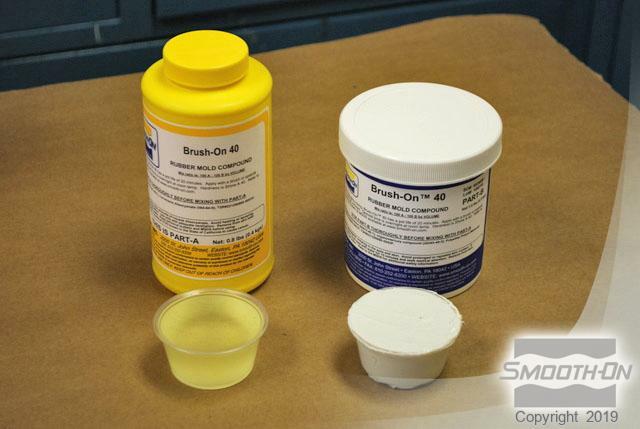 In the following example, Brush-On 40 is thinned with mineral spirits, brushed and airbrushed onto the surface of a Reoflex 30 casting. 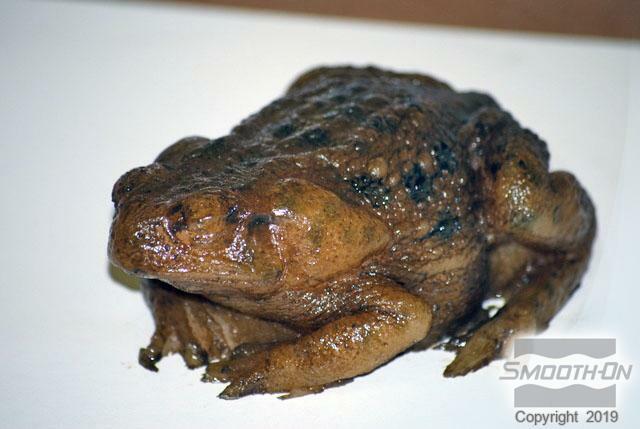 The frog was cast into a Smooth-Sil 910 mold, making release agent unnecessary. 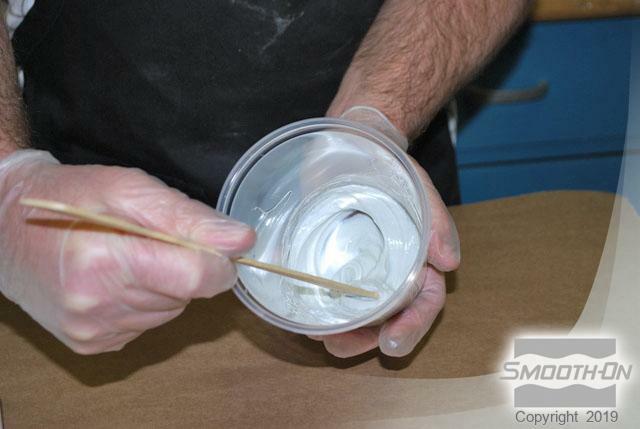 If a release agent were used, it would need to be thoroughly removed from the piece using an appropriate solvent before a casting could be painted. 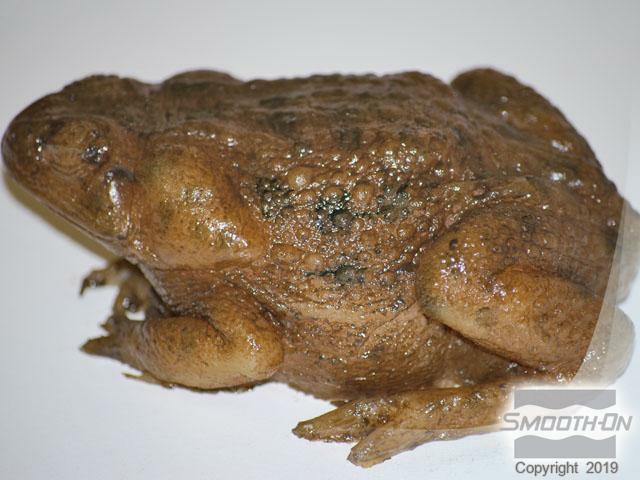 This finished prop is durable, realistic, and has a long-lasting surface finish. Begin by gathering all the materials needed. 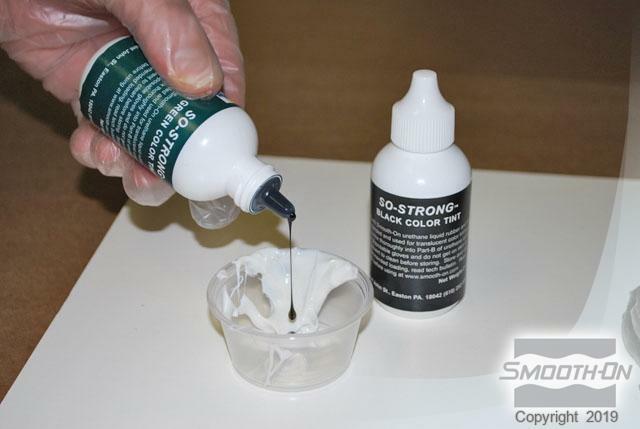 Then remove the Reoflex 30 casting from the Smooth-Sil 910 mold. 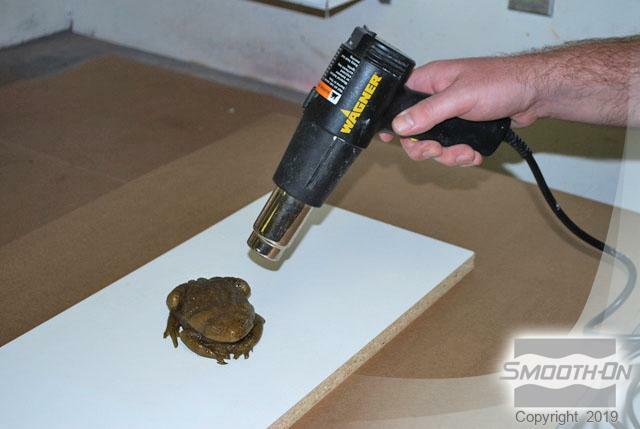 Place a melamine coated base board on a countertop and place the frog casting on the melamine board. Measure out the Brush-On 40 rubber 1A:1B by volume. 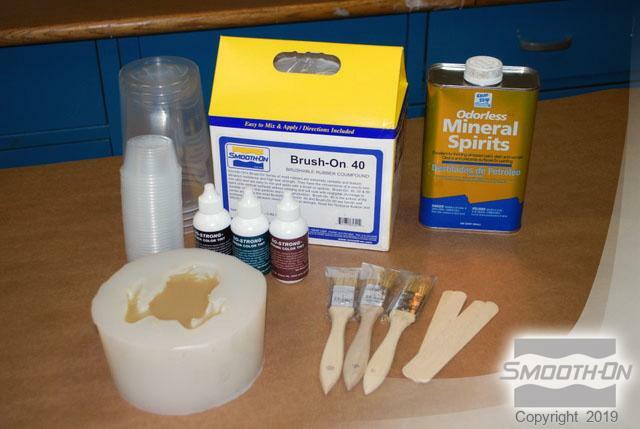 Place part B of the Brush-On 40 in a mixing container first, and then combine with part A. Mix the material thoroughly. 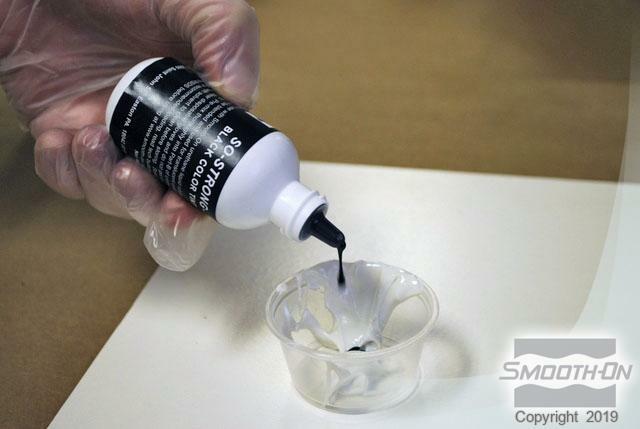 Put a small amount of the mixed material into a small cup and add So-Strong brown tint. 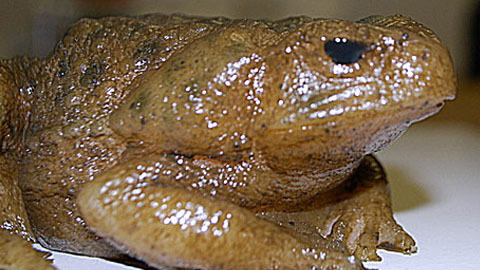 Mix the pigment into the material. 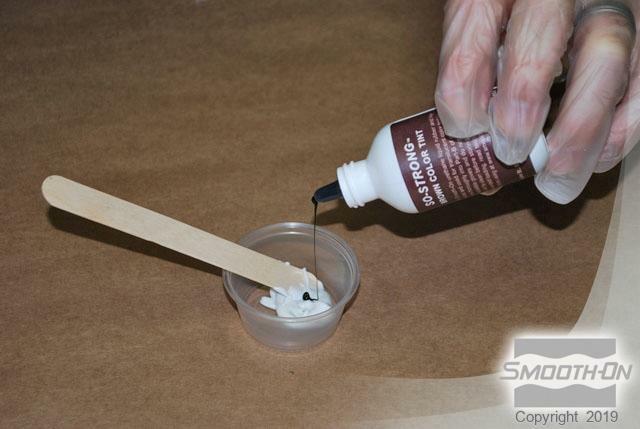 Then, add a small amount of mineral spirits to thin out the Brush-On 40 rubber and mix in thoroughly. 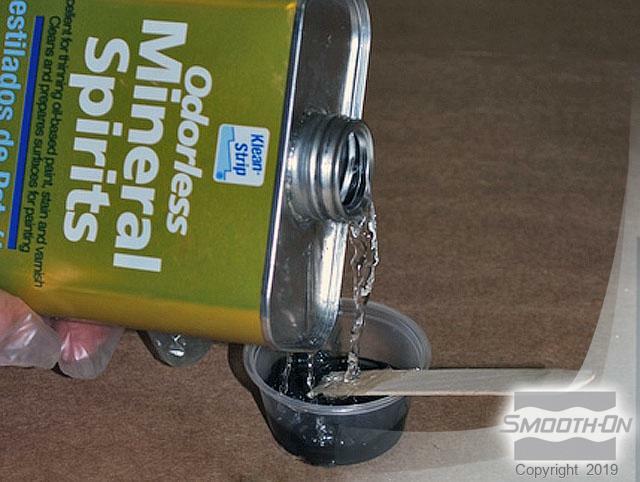 Apply this mixture as a wash over the entire piece, taking care to coat all surfaces. 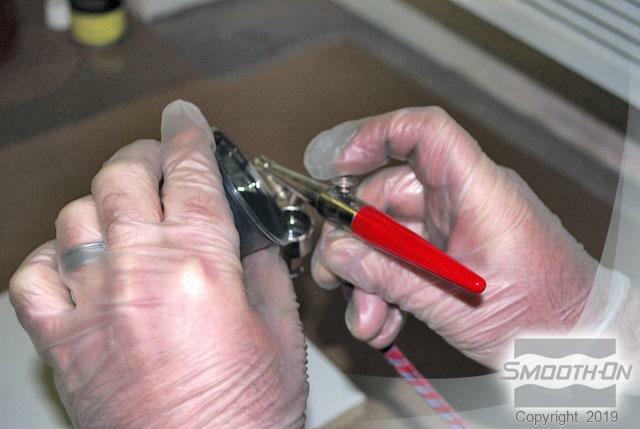 Use a heat gun to accelerate the curing of the Brush-On 40. 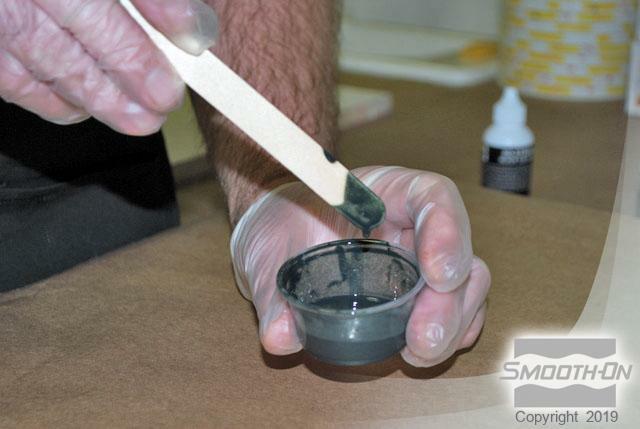 While there is still a small amount of time remaining in the Brush-On 40's pot life, dispense more mixed rubber into a small cup and add So-Strong green tint and So-Strong black tint. 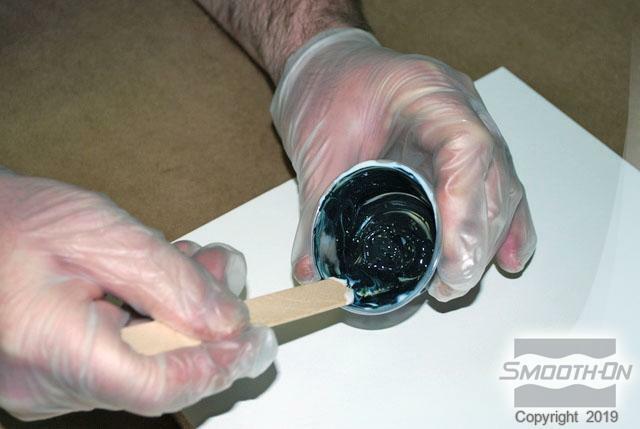 Mix the Brush-On 40 and pigments together thoroughly. 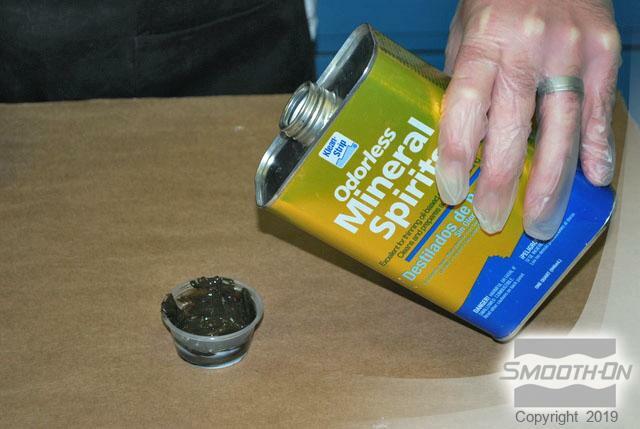 Add approximately 5 parts mineral spirits to create a thin mixture, about the consistency of milk. 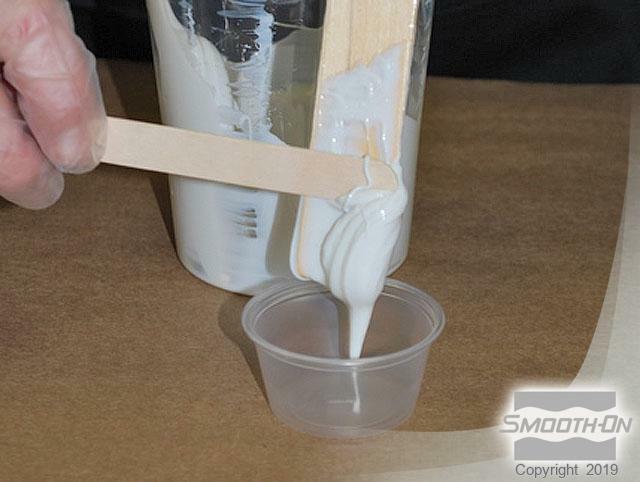 Pour this mixture into an airbrush and use to paint the small details. 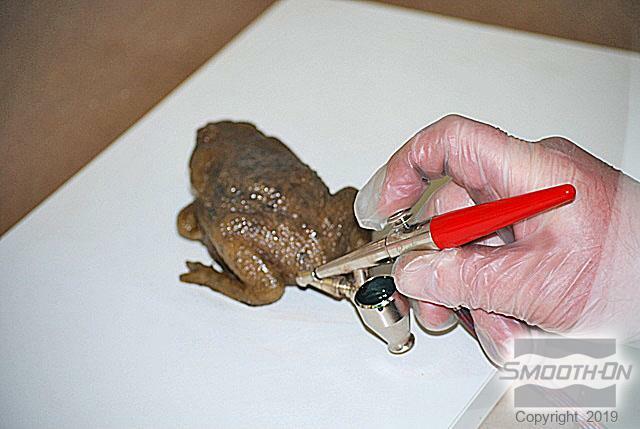 The thinned rubber will flow through the airbrush smoothly. 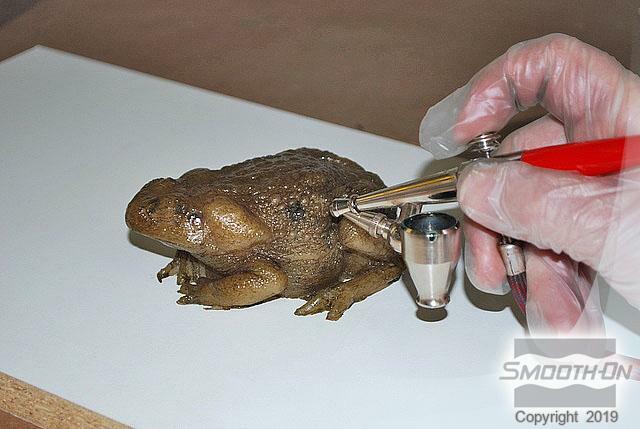 Once the skin detail has been completed, paint the eyes using the same Brush-On 40 mixture with a brush. 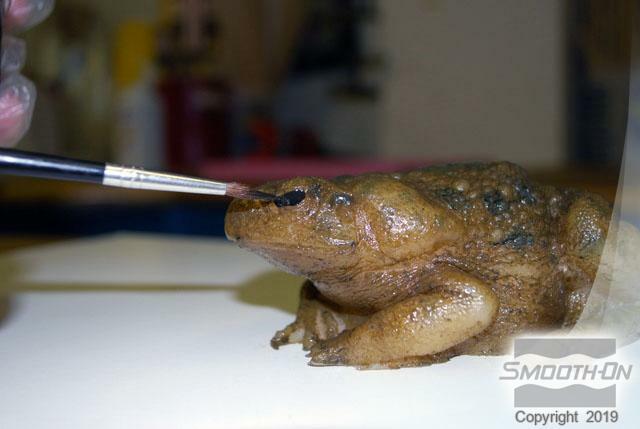 Finally, allow the completed piece to cure overnight. 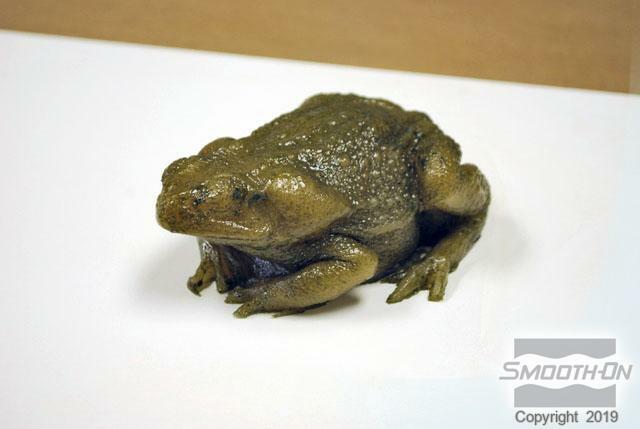 After curing, the completed piece is realistic, and the paint is very durable.